In a cell, structures in excess of 20nm require energy-dependent motility to travel through the cytosol. Therefore viruses with entire capsid or large genome entering the cytoplasm utilize molecular motors to move through the cytosol. The majority of viruses use microtubules but some have been described as using actin cytoskeleton. Microtubule-dependent transport involves motor proteins like dynein and kinesin and is mostly used by viruses that target their genomes to the nucleus. 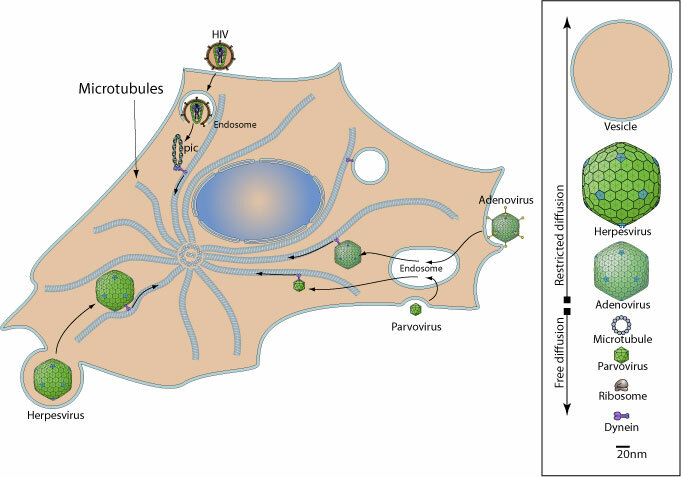 Neurotropic viruses, for example, enter nearby nerve endings and their viral genome must be moved to cell bodies by axonal transport (retrograde transport).